Here are her top tips for how to keep the kitchen safe and clean during the holiday. Being the person who gave guests food poisoning is not the way a Thanksgiving host wants to be remembered. 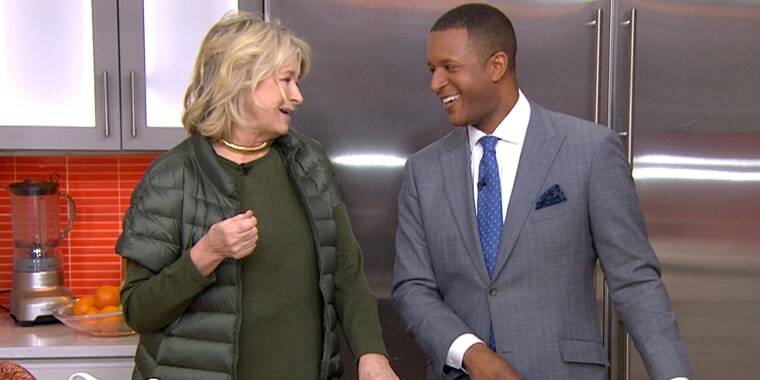 That's why domestic goddess Martha Stewart stopped by the TODAY Show to share her top tips for keeping the kitchen clean as a whistle over the holidays and every other day of the year. "I have never been sick cooking a turkey," Stewart told TODAY's Craig Melvin on Tuesday. "There are some simple steps that people should pay attention to." 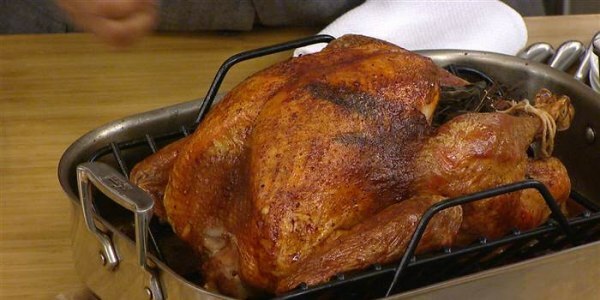 Here are Stewart's tips for the best way to thaw meat, clean cutting boards and other easy tricks to for preparing food safely for Thanksgiving, Christmas and beyond. "No. 1: Wash your hands frequently, like a Japanese sushi chef [who is] always washing his hands," Stewart told TODAY Food. Make sure to use hot water, soap and wash (really, scrub) about 20 seconds. 2. Use disposable towels and latex gloves. When cooking up a storm, this is a simple way to keep messes and bacteria at bay. "Wipe up any turkey juices," said Stewart. "Turkeys are real juicy when they're just thawed, and also when they're roasted. Use paper towels. Don't use a cloth. It just makes it a little more difficult." Stewart likes using latex surgical gloves to help keep her hands nice and clean. Just be sure to change out gloves when switching from vegetables or bread to handling raw meats. 3. Sterilize the work area. Wipe down the counter top with a bleach mixture that's made with 1 tablespoon of bleach to 1 gallon of water. The mixture is also great for cleaning sponges. Wash cutting boards and utensils in hot, soapy water immediately after using them. Also, it is very important to get rid of any raw meat or poultry juices as soon as possible. Stewart has found that placing a layer of parchment paper on the counter and cutting board keeps the juices in one place. This one little kitchen hack makes a huge difference for her. "I work on a piece of parchment paper because all the juices are on here, and you go like this, throw it away," Stewart told TODAY Food, as she crumpled and discarded a sheet of parchment paper. "Then use another board for cutting your vegetables, chopping your stuffing vegetables, your bread. And I prefer acrylic cutting boards to wood cutting boards." A great cutting board doesn't have to break the bank either. 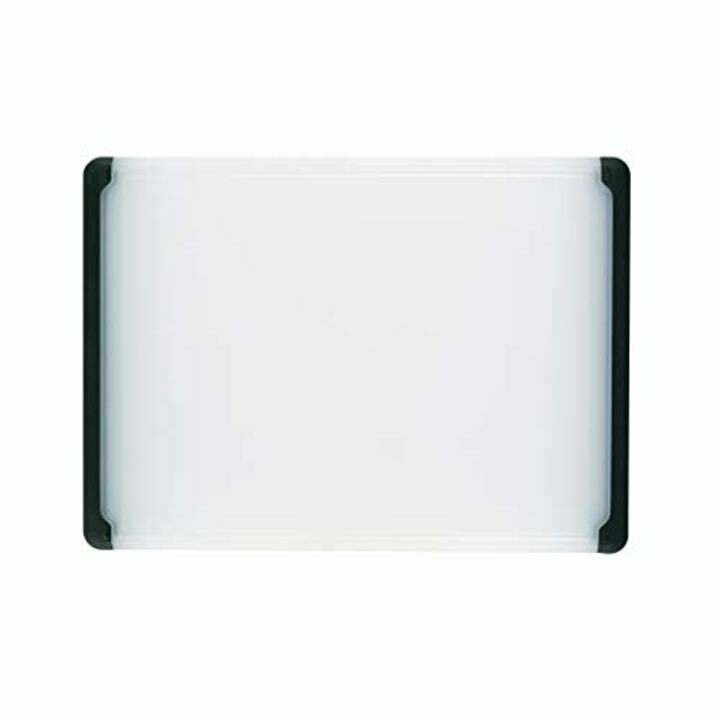 TODAY Food editors recommend the Oxo Good Grips Utility Cutting Board, which has rubber at each end that prevents the board from slipping. It's also dishwasher safe. 4. Don't rinse the turkey. Stewart admitted that she still rinses her turkey by dipping the whole thing once in a large tub of water and vinegar, but the FDA advises against it. Raw turkey juices can splash onto other areas and contaminate them. 5. Thaw raw meat properly. Don't thaw a frozen turkey by leaving it on the counter. Stewart recommended thawing a turkey in its original package in the fridge for two days. 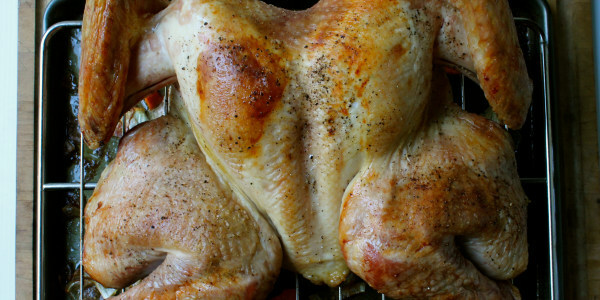 See TODAY Food's step-by-step guide for how to thaw a turkey safely for more methods that work. 6. Roast the turkey in a heavy duty pan with a rack. 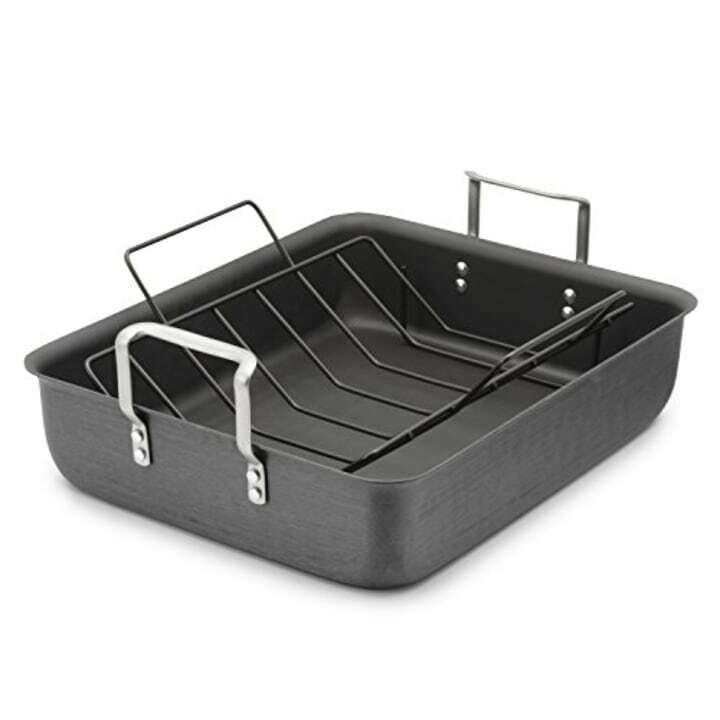 While Stewart recommended using disposable items like gloves, towels and parchment paper for kitchen clean up, the roasting pan needs to have a sturdy build. Stewart isn't a fan of what she called "those very floppy aluminum pans." "You can drop the turkey on the way to the table," Stewart told TODAY Food. "That's a bad thing." In fact, she told TODAY Food that she's been known to stop folks in the grocery store to tell them to go buy a proper roasting pan with a rack. It may be a larger investment up front, but it will ensure that beautiful turkey gets to the table. TODAY Food editors recommend Calphalon's 16-Inch Roasting Pan, which has a nonstick rack that makes it easier to remove the bird. "Always use the thermometer," Stewart told TODAY Food. "Put it down into the stuffing, into the center and into the thickest part of the thigh." The turkey must reach the magic number of 165 degrees. 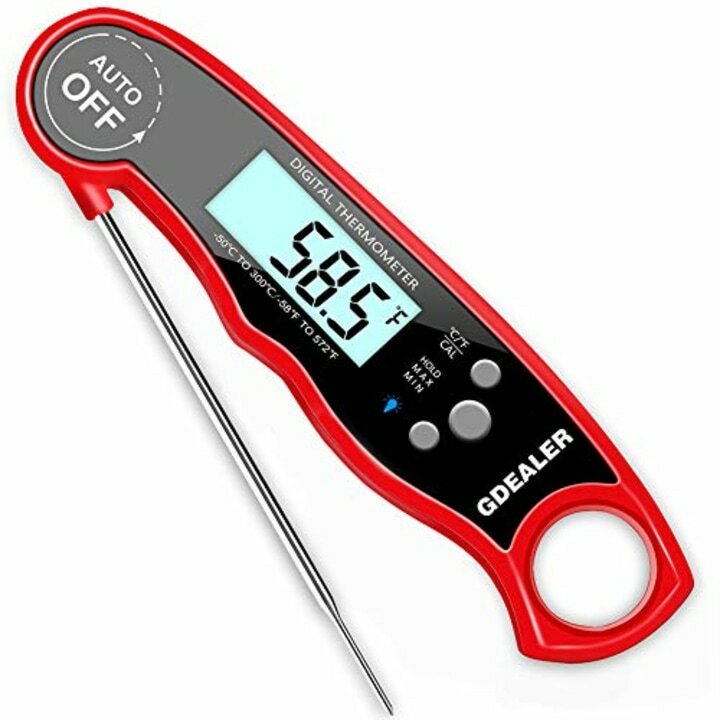 TODAY Food editors recommend the GDealer Digital Instant Read Thermometer, which is a helpful tool for summer grilling, too. It's all too easy to pick at the turkey carcass once the guests have gone home, but don't do it. The Center for Disease Control recommends placing leftovers in a refrigerator that's 40 degrees or colder, within two hours or less of serving them. If the leftovers have been sitting out longer, throw them out. 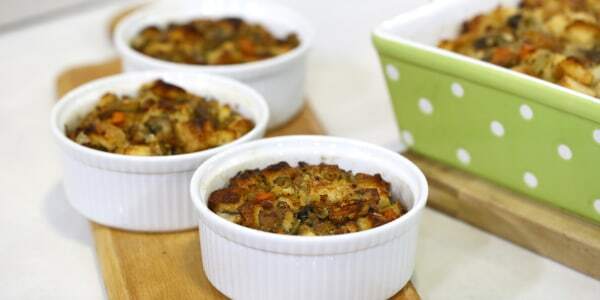 Rather than putting a whole casserole dish of hot food in the fridge to eat later, portion it up in smaller storage containers so it cools faster. That will help keep bacteria from growing. The CDC also advises tossing or freezing leftovers within four days of Thanksgiving. Stewart, however, told TODAY Food she caps her post-turkey day munching at three days.